Harrisburg – Today, at an early morning General Meeting, the Republican Party of Pennsylvania voted to endorse attorney Vic Stabile for Superior Court and re-elected Rob Gleason as Committee Chairman. Lieutenant Governor Jim Cawley spoke praising Governor Corbett’s fiscal leadership, citing the creation of 100,000 new jobs in Pennsylvania and the expected announcement of a new $4B petrochemical plant in the Pittsburgh suburbs. He also promoted the Governor’s proposed budget reforms; his mention of liquor sales privatization was met with enthusiastic applause. The committee held elections for its leadership positions and results across the board were unanimous: re-election for Rob Gleason – Committee Chair, Joyce Haas – Vice Chair, Carolyn Bunny Welsh – Treasurer, John McNally – Secretary, and Peg Ferraro – Assistant Secretary. 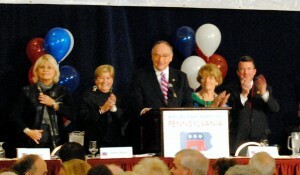 The biggest order of business was the party’s vote to endorse in the race for Pa. Superior Court. Attorney Vic Stabile, the party’s 2011 candidate and a former Chair of the Cumberland County GOP, won the endorsement unanimously. On February 7th, Stabile received a rating of ‘recommended’ from the Pennsylvania Bar Association. Earlier in the morning, Judge Rob Wyda withdrew his name for endorsement for Superior Court but said he will remain in the race. He narrowly won a straw poll vote by the central caucus; Stabile won the remaining 5. “I’m not running against the party. I’m not running against Vic,” Wyda said. He emphasized that he wants instead to build momentum should be become a nominee or candidate in the future. The question of retention for Pa. judges won’t be on the committee’s agenda until the summer meeting, although the northeast caucus reported having voted in session not to endorse Chief Justice Castille for retention. Ol’ “payraise” Sam getting ready to run again….fantastic! That will draw votes from the other loser, Bruce Castor. As a conservative leader I am disgusted with Rob Gleason is again elected Chairman of the Republican party. He is a disgrace and has done a terrible job, that is because he is a closet liberal. The conservative base worked to get Sam Rohrer elected as Chair, but he is gearing up for his primary run against Corbett. Time to take out all the liberal Republicans starting with one-term Tom! Elections have consequences, including “obscure elections” such as state committee. Congratulations to the NE Caucus for NOT endorsing Republican Supreme Court Judge Ron Castille, who is running for retention. After all, he voted against the Republican-drawn district lines because he decided they violated the Constitution. Imagine–he didn’t vote with the other 2 Republicans because he listened to his conscience. We certainly can’t have that. Rob Gleason is your leader and Vic Stabile is your candidate. How can you lose with those winning geniuses? Vic Stabile couldn’t win his own caucus vote, and the caucus chair nominated him for endorsement? After the last tow years of failures of state GOP-endorsed candidates, you’d think that the apparatchiki of the politburo-style GOP would be smart enough to learn their lesson…they aren’t.